Before my first daughter, Anjali, was born I was terrified. What did I know about raising children? I was the youngest in a family of four. I had never been around children and couldn’t imagine a person who knew less about children, children’s psychology, or even the basics of changing a diaper. In the second trimester of my wife’s pregnancy, I was so anxious that I had a funny but terrifying dream of this baby that was coming into my life. I dreamed that my wife, Laura, and I were walking down a corridor. As Laura walked beside me, she held a baby. In the dream I knew it was our baby. I felt some level of anxiety but Laura was so happy that she was literally glowing. As we walked along, she gave me the baby to hold. I felt my anxiety level rising as I tried to make sure that I didn’t drop the baby. As we walked, the baby started to get bigger, not older, just bigger. I tried to keep up with Laura but my arms felt like they were burning under the weight of this baby. As I continued to fall behind, I felt even more stress. Finally, Laura walked through a door and beckoned for me to step through. When I got to the door, I realized that the baby was too big for me to get both of us through. It was at that point that I woke up, screaming, and drenched in sweat. At the time, Laura thought it was so funny she couldn’t stop laughing. I didn’t think it was all that funny. Over the years, as I thought back to that dream, I realized that my anxiety wasn’t based on a fear that I wouldn’t be able to do the basics for my children, but that somehow I wouldn’t be loved by them. In my heart, I think I realized that I would fall madly in love with my children and that the intensity would persist throughout a lifetime. What I wasn’t so sure about was whether or not they would love me back. In the years since Anjali’s birth and the births of my other daughters, one thing I have realized is that a child’s love for her parents is the closest thing to unconditional love we have on earth. The girls have taught me so much about unconditional love. I’m just glad I was able to slow down long enough to learn their language of love and fully feel it. 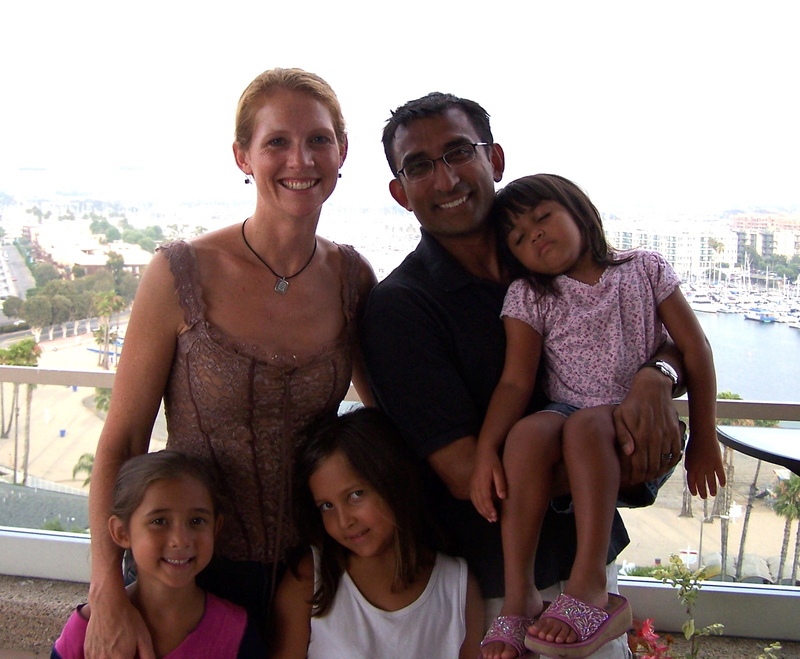 Sugata Biswas lives in Newbury Park, California, with his three daughters and always lovely wife. He works as a market researcher and enjoys participating in triathlons. He would welcome comments and communication at sugata_biswas@yahoo.com. As I write this, I have only been a parent for ten years, one day, and about nine hours. I hope you will forgive my imperfections thus far. I am very inexperienced, after all. But you three little beans have taught me a lot–about love, patience, anger, frustration, and joy. I would not trade my life with you for anything. Looking back on those early parenting days, one thing I learned the hard way is that letting other people hold your baby is not necessarily a bad thing. I was so selfish. I can remember actually feeling annoyed when Grandma came to visit and all she wanted to do was hold the new baby–her first grandson. I know. I resented it a little bit, and have always regretted that, as I came to learn with subsequent babies that sharing is all right. I’m a bit of a selfish creature (shocking, yes) and I wanted to spend every second with my new baby. I felt cheated out of precious minutes of staring at his face when others got to do it. I did get better about that after a few months, but in my mind it was always a little too late. Please share your babies. Especially with me. Someday I will be the grandma. Another thing you have taught me is to look at life from another view. Everything looks interesting to a small child–the bug on the sidewalk, the rock on the shore, the huge and endless sky. Sometimes, being so much bigger and taller than you, all I can see is where we need to get to. I’m in a hurry and I can see the place we need to be, but you always slow me down because you’re noticing something miraculous. I hope you never stop looking at life’s little miracles. Life is not about the destination; it’s about the journey. I thank God for your slow footsteps that forced me to stop and smell the flowers when I might have rushed by to get someplace unimportant and mundane like Target or the post office. Lastly, you have taught me what it is to love unconditionally. Where else could someone nag you daily to hang up your backpack, put your shoes away, finish your homework, eat your dinner, stop being silly, sit down on your chair, stop punching your brother, go take a shower, brush your teeth, pick up your toys, and still get a hug every night? I nag, and I nag, and still you reach for me with your arms outstretched, waiting for a kiss and a hug before you climb into bed. If that’s not real love, I don’t know what is. Ch ristie, the mother of three children, lives in Missouri. She writes at Sties Thoughts.